This really was my "goal race". 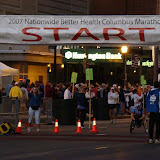 Back in February 2007, I set a goal to run the Columbus Half Marathon this year. Well, I did. However, I gotta say that after the 20K Indian Trail Run last September, this race was (almost) a walk in the park. I didn't stop once from exhaustion and I held a damn strong pace the entire race. I'll be totally honest, I wasn't nervous or worried about finishing the race, but I wasn't quite sure how I was going to do with my mindset. James and I were in Tulsa, OK for Tulsa TechFest 2007 (which was a blazing success by the way). We didn't back to Columbus until 7:30pm Saturday night. By the time I got back into Newark, it was almost 9pm and Jennifer talked me into stopping at my parents for a cookout. I had honestly wanted to just go home and go to bed because James and I were up all night Friday night posting Data Dynamics Analysis to the website. We ended up staying at my parents cookout until 10:30pm and by the time we got home and settled down, I didn't go to sleep until 1am!! The race environment was absolutely awesome. There were people on the side of the road every step of the way cheering the runners on. I heard "Amazing Grace" on the bagpipes, I heard a high school drum line rocking out at a couple of spots along the way (that was really cool too btw), and there were many local musicians setup along side the road playing their instruments for the racers. Many of the local residents of Columbus sat out in their yards cheering on the runners too. It was simply awesome to be a part of this. I knew the race was going to be easy at about the 3 mile marker believe it or not... I was so in tuned with everything around me that I didn't even thing about the fact that my body only had 4.5 hours of sleep in the last 48 hours. My senses were all on overdrive that I didn't even notice that my legs were moving at a 9 minute pace! I met a lot of people on the course too. Lots of runners had little sayings on their shirts. For example, one lady had a shirt on and the back said "My name is Linda. I'm 50 years old today, and this is my first marathon!". So of course, as I passed her, I congratulated her and wished her a happy birthday. This was the whole race too, I talked to so many people and everybody was so nice. The course finished on a slight uphill climb, but then turned a corner and the finish line was toward the bottom of a nice downhill slope. I finished the race with a 9:09 mile pace. Going into the race, I told myself that I wanted to to have a sub 10 minute mile pace. I finished the 13.1 mile race in 2 hours 7 minutes 12 seconds. This calculates to a 9:43 pace!! Never would I have guessed that to be possible! Never! There really isn't much more to say about my first 1/2 marathon experience other than it was a blast. I'm so happy that I did it. I'm already planning my 26.2 mile adventure for next spring. There are actually quite a few marathons in the spring, so I'm going to do my research before committing to one.